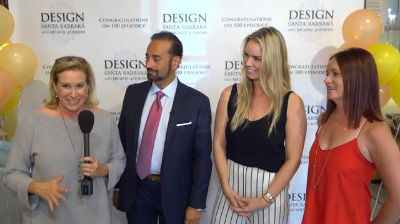 On this Episode of Design Santa Barbara we celebrate our 100th Episode. Joining us for this festivities are a few of our past guest. We have had these guest on our show through out all 10 seasons. An award wining design show promoting local interior designers. Laura Welby, Certified Interior Designer, is now retired after being the instructor. From Interior design program at Santa Barbara City College. She has loved being a full time instructor at the college for the last 25 years. Was also chair of the Drafting/CAD Department for the first 16 years. Welby brought the credit Interior Design Program back to the college in 2000. She has a Bachelor’s Degree in Architecture from Cal Poly Pomona. After graduation worked in local architectural and engineering offices for seven years. Then had her own residential design business for eight years, remodeling and designing client’s homes as well as her own. Though teaching full time she continues to do consulting in interior design, specializing in kitchen design. Dana Newquist is a historian, philanthropist, alzheimer’s as well as a dementia care specialist. Dana and his wife ars Owners & Administrators of Mission Villa in Santa Barbara. Mission Villa is an assisted living facility specialized in dementia and memory care. Founded in 2000, Mission Villa was from it’s inception designed as a dementia care facility. With the help of countless experts we designed the facility to provide safety, security, and above all else comfort and well-being for each of our residents. Because it was custom built for dementia residents, all the modern features known to be advantageous for this population have been incorporated. Mission Villa retains the feel of a family home, where each of our fourteen residents enjoys a suite decorated with warm antiques and cherished family heirlooms. in conclusion,Nestled in beautiful downtown Santa Barbara, residents enjoy all the comforts of a home-like atmosphere, staffed by kind and caring professionals dedicated to providing the highest quality of life possible. A native of Chicago, Dana studied business at Riverside City College in California and Northeastern University in Boston. Dana served the U.S. in the Army Medical Corps. Furthermore, his association with President Ronald Reagan led him to dedicate his first dementia facility, Alzheimer’s Four Seasons, to President Reagan in 1996. Actively Involved in serving his community, Dana serves on the Boards of the Alzheimers’s Association, Sansum Diabetes Research Institute, Montecito Fire Protection District, and the Murphy Auto Museum. In addition, He’s an American Red Cross instructor and president of the Antique Automobile Club of America, Santa Barbara Region. Leesa has been obsessed with houses and their contents since she was a child. On a visit to a friend’s house as an eight year old. She couldn’t stop staring at the family portrait over the fireplace and thinking that it was hanging too high. Furthermore, she was right, as she came to find out later, in a History of Design class. As a result, Leesa has lived and worked in six cities and on two continents. Blending successful backgrounds in fashion design and buying and residential property development. In addition, she brings not only a critical eye to her work but a respect for the bottom line. Design and Art History instruction in London at the Inch bald School of Design. In addition, The British Museum and the Victoria and Albert Museum solidified her transition from the world of fashion to that of interiors. In past episodes we have had a great pleasure of inviting students from Santa Barbara City College Interior Design Program. Interior design focuses on the creation of interior environments that are both functional and pleasing. The field offers a variety of employment opportunities with interior design and architectural firms, kitchen and bath design studios, as well as with interior materials and furniture stores. A combination of education, work experience. In addition, Passing the National Council for Interior Design Qualification (NCIDQ) exam is required for interior design professionals. Furthermore, the Santa Barbara City College Interior Design Program, offered within the Drafting CAD Department. Provides comprehensive training for entry-level interior design positions. In conclusion, It is a vocational program, not a transfer program. Certificated, professionally experienced instructors teach all courses.